Second installation of the "dekinu character" pin badges! 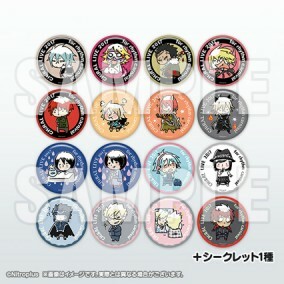 Second installation of trading pin-badges featuring the cute and deformed "Dekinu Characters." 16 known and 1 secret varieties to collect, sold in blind packaging. The excitement lies in finding out which ones you get! "Dekinu Characters" are a type of exhausted looking SD-style character by Uiro Yamada. That attain that perfect balance of looking just like the character but not quite. Limited to a purchase of 10 units per person. First available at CHiRAL LIVE 2017 for rhythm carnival Vol.2. DRAMAtical Murder: Morphine Hoodie - Reprint Ver.